For a limited time, buy 1 box of Protein Brownies, & get 1 50% OFF! 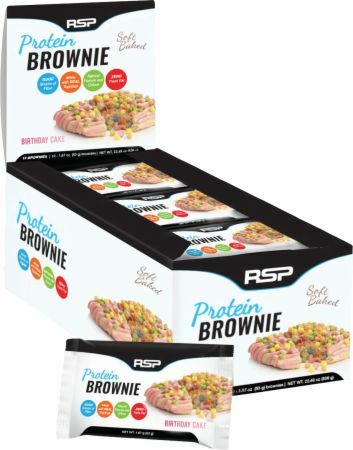 RSP Protein Brownies are formulated with premium flavor and optimal nutrition in mind. Delivering 16g of premium, blended protein per brownie and 4g of dietary fiber for promoting healthy digestion, this premium, on-the-go treat will fuel your day no matter what challenges lay in front of you. 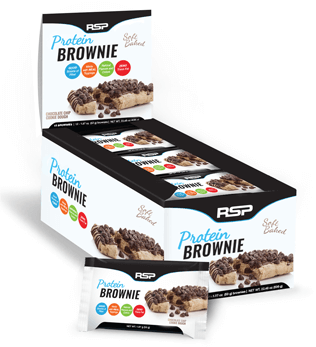 Just as important as what goes into our brownie is what doesn’t, and that’s why RSP Protein Brownies are free of artificial colors, flavors and trans fats. What you’re left with is superior nutrition and gourmet taste. Great protein brownies. I use them to keep me full in between meals and as a snack. Great taste. Kept me full in between meals. Great taste, ingredients, and texture. I love the RSP brand, so when they came out with these I had to try them. They consistence of the product is a little denser than an actual brownie, however it still tastes great! These brownies are great for an on the go snack or to curb a sweets craving. Very tasty treat. Great to take edge off with protein source. Both, chocolate chip and fudge are delicious. All RSP products are a staple in my nutrition. I bought a bunch of these during a BOGO sale for a church brother serving in Afghanistan. Good taste, filling, and easy to consume on the go. I knew they would serve as well as him on deployment. I bought these when I was looking for a good deal on protein cakes and there was a good discount on RSP prodcuts. I also buy their Amino Lean and Creatine Monohydrate products and figured I'd give their protein brownies a try. They're pretty good, a good post-workout snack. I bought these to use whenever I travel and they're as handy as any other protein bar/cake/brownie. My only issue is with the presentation of the product. For their Chocolate Chip Cookie Dough brownie, it looks a little lazy with how all the chocolate chips are placed on just one end of the brownie and you have a bunch that collect at the bottom of the bag upon opening. It didn't really seem like the flavor was baked or infused into the brownie but was just instead placed on it hastily. After I bought these, I knew I had to warn everyone. They were by far the worst bars I ever ate; really dense and hard like a brick, so I had so eat it with super hot tea or coffee, and also waaaay too sweet. I don't know how it got such a high score, I ate them just because I felt bad for my money. Although I have to be honest and say- maybe it's not the company's fault, It might be delivered in a really bad way, like left in the sun or something. If so, I warmly recommend to change this delivery service. Love this brownie. It's filling and comes in handy when you are running around and have no time to cook or stop for a meal. I even heat up the cookie dough sometimes for that extra softness. Great quick snack! love the flavor. The only reason I didn't go with 10 is because its so much better if you give it a quick 5-10 seconds in the microwave to soften it up. I'll definitely re order to use as quick snacks when I'm rushing out of the house. Protein Blend (Whey Protein Isolate, Whey Protein Concentrate), White Chocolate Wafers (Sugar, Whey Protein Isolate, Whey Protein Concentrate, Vegetable Oils [Palm, Palm Kernel], Maltitol, Soy Lecithin, Vanilla, Sucralose), Vegetable Glycerin, Chicory Root Fiber, Soy Protein Isolate, Sugar, Confetti Flakes (Sugar, Brown Rice Flour, Corn Syrup, Sunflower Oil, Citric Acid, Natural Lemon, Cherry Lime, Orange Flavors, Coloring Agents (Beet Juice, Watermelon and Huito Fruit, Paprika Extract, Turmeric Concentrate), Margarine (Palm Oil, Water, Soybean Oil, Whey, Mono and Diglycerides, Soy Lecithin, Natural Butter Flavor, Beta-Carotene, Vitamin A Palmitate), Palm Oil, Water, Brown Rice Flour, Corn Syrup, Natural Flavors, Baking Soda, Salt, Potassium Sorbate, Almond, Peanut, and Sucralose. Directions For Protein Brownie: Consume up to 3 brownies per day between meals with appropriate fluid intake.